Melissa & Doug’s Suspend Game is an aerial form of pick up sticks, except you are adding pieces by hanging them on the puzzle frame instead of taking pieces away. This very clever game of balance involves tricky hanging manouevres that result in the puzzle teetering, wobbling, shifting, tipping and maybe even collapsing. To add to the challenge of balancing your playing rods strategically so that the puzzle doesn’t collapse, players must hang their game rods on the puzzle frame using only one hand! Cause one or more pieces to fall in your turn, and you must add them to your pile. The first person to use up all their pieces is the winner. Suspend a great game for stimulating problem solving, spatial planning and fine-motor co-ordination skills while being fabulously fun at the same time. As a family we have been highly entertained by this game and I highly recommend it. 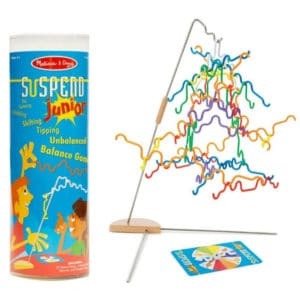 Suspend Junior has a wooden base, metal frame, plastic colour-coded rods, and a spinner to provide instructions for play. Suspend traditional has a wooden base, metal frame, metal colour-coded rods and a colour dice to provide instructions for play. There are more game options with this version. Both can be played solo or in a group of up to four players. After assembling the stand and the frame, distribute the 24 game rods between each player who will each receive the same number of long and short colour-coded rods. The winner is the player who uses up all his/her pieces first. Take turns hanging pieces onto the frame, starting with the longest pieces and working toward the shortest. The first player to run out of pieces is the winner. Take turns rolling the colour dice. This instructs you which coloured rod to hang in your turn. The first player to run out of pieces wins. In this version of the game there is scoring involved based not on the number of pieces left in their pile unplayed, but on the number of notches on each of those pieces. For example, a black piece with three notches is worth three points and an orange piece with seven notches is worth seven points. Any player with 20 points or more at end of a round is out so it is a process of elimination until only one player is left. 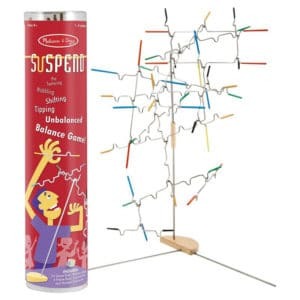 The Melissa & Doug Suspend games were reviewed by Nikki Bush for Toy Talk. Suspend was selected for Nikki’s highly recommended short list of games and toys in 2014 and she continues to recommend it for family fun.